Villager (referred to as Animal Crossing Boy in his Super Smash Bros. Brawl trophy description) is the default main character and player avatar in the Animal Crossing series. Animal Crossing Villagers have made some crossover cameo appearances in Mario games. The villager's first appearance in the Mario franchise is in the Animal Crossing: Wild World microgame in WarioWare: Smooth Moves, in which the objective is for the player to catch a fish. The villager seen in this game, however, is not based on any specific villager artwork in the Animal Crossing franchise. This microgame returns in WarioWare Gold. In Super Smash Bros. Brawl, a villager occasionally appears in the background of the Smashville stage. According to Masahiro Sakurai, the Animal Crossing villager was at one point planned to be a playable fighter, but was removed as he wasn't considered to be suited for battle. Villager exits an Animal Crossing-style house. Villager appears as a playable character in Super Smash Bros. for Nintendo 3DS and Super Smash Bros. for Wii U, taking his appearance from the cover art of Animal Crossing: City Folk. 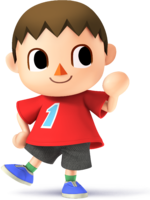 Unlike most characters, the Villager has seven alternate costumes based upon various villager designs, four male (including the default appearance) and four female. 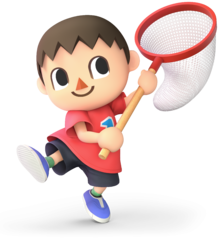 Villager's moves are mostly based around the Animal Crossing series, such as using a shovel to bury opponents as his down smash attack, firing a slingshot as his forward aerial attack, and using a net for his grab. Villager's standard special move is Pocket, which allows him to grab any items or projectiles and store them for future use. His side special is Lloid Rocket, which summons a Gyroid that flies forward into opponents and explodes. His down special is Timber, which causes him to plant a tree that he can cut down to have it fall on opponents. Finally, Villager's up special is Balloon Trip, in which he uses a pair of balloons to fly upward that can be popped, based upon the game Balloon Fight. 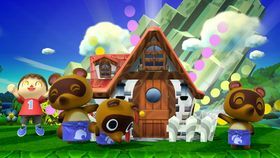 The Villager's Final Smash is Dream Home (Housewarming Party in PAL versions), in which Tom Nook and Timmy and Tommy appear and build a house around opponents that explodes. The villagers that appear on Smashville in Super Smash Bros. Brawl also return in this game along with the stage. Villager returns as an unlockable playable fighter in Super Smash Bros. Ultimate. Players can now see what the Villager has pocketed over the HUD icon on the bottom of the screen. Additionally, Villager can now pocket items with their net grab. Other than this, Villager's moveset is largely unchanged. Villager cameos alongside Bowser Jr. and King K. Rool in the reveal trailer for Ken Masters and Incineroar, where they are shown wanting to challenge the latter over the former's defeat, much to Incineroar's chagrin. Pocket is Villager's standard special move, based upon the collection aspect of the Animal Crossing series. When used, Villager reaches out and grabs any nearby items or projectiles directly ahead and puts them away; the player can then press the button again to use it, projectiles and larger items being automatically thrown, while smaller items are held and must be thrown, and can be stored again by pressing the button once again. The player can also pocket items after normally grabbing them. In Super Smash Bros. for Nintendo 3DS and Super Smash Bros. for Wii U, the first custom variant for this move is Garden, which can only pocket in front of Villager, but the move also damages opponents and plants a flower on their head. The second is Pocket Plus, which gives the move an extended range but makes anything pocketed less powerful when using them. Lloid Rocket is Villager's side special move. Villager pulls out Lloid, a Gyroid, which then rockets forward and explodes when it hits a wall, item, or opponent or automatically after a certain amount of time. 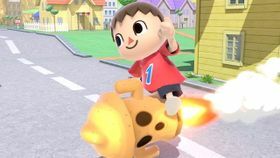 Villager can also ride on Lloid by holding down the special move button when using the move. When used in the air, Lloid travels at a downward arc which increases as he travels farther. Jumping off of Lloid while riding at any point in the air leaves Villager helpless. In Super Smash Bros. for Nintendo 3DS and Super Smash Bros. for Wii U, the Lloid Rocket's first custom variant is Liftoff Lloid (parsed Lift-off Lloid in the PAL version), which fires a Gyroid that flies up, giving little horizontal distance; Lloid also flies faster but explodes more quickly. The second variant is Pushy Lloid, which features a larger but slower Gyroid that pushes opponents back before exploding sooner than the default move. Balloon Trip is Villager's up special move, based upon the "Balloon Trip" mode in Balloon Fight. Villager dons a hat that has two balloons on it, and can fly freely through the air. Holding the special move button causes Villager to fly up. 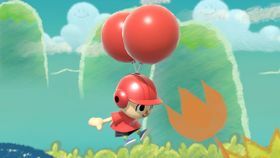 After some time, the balloons automatically detach from the hat, causing Villager to fall in a helpless state; the player can also do this at any point during the move by pressing a standard attack button. Opponents can also attack Villager to pop the balloons; popping one decreases Villager's mobility and height gain, and popping both leaves him helpless as he falls. 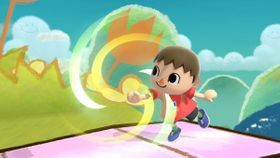 In Super Smash Bros. for Nintendo 3DS and Super Smash Bros. for Wii U, Villager's first custom variant for this move is Extreme Balloon Trip, which cannot fly up as high but the balloons explode when popped, and can be individually popped by pressing the attack button; landing also causes the balloons to fly a short distance before popping. The second variant is Balloon High Jump, which causes Villager to jump up rather than fly; while the move does not give as much vertical distance, the balloons damage opponents on the way up. Timber is Villager's down special move, consisting of three individual steps. Villager first plants a sapling into the ground; this part of the move fails if used on a slope or ledge. The sapling also automatically disappears after some time. By using the move again while the sapling is active, Villager pulls out a watering can, which grows the sapling into a full-sized Animal Crossing-style tree; the growth of the tree also damages opponents and knocks them up into the air. The water is able to push back opponents, and Villager can move and jump while watering. The tree also disappears after some time automatically, and disappears sooner if attacked. 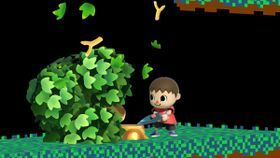 Finally, when the move is used while the grown tree is active, Villager pulls out an axe to cut down the tree and deal damage to anybody on the falling side of the tree; the tree must be struck twice on one side before it falls over. The fallen tree may also occasionally create a piece of wood that can be thrown, or a piece of fruit that can heal damage. The axe can also be used to attack opponents. In Super Smash Bros. for Nintendo 3DS and Super Smash Bros. for Wii U, the first custom variant for this move is Timber Counter. In addition to each of the stages of the attack being faster, the sapling can trip opponents, and the tree can counterattack; however, the tree is not as powerful when cut down and is less durable, and the watering can does not push back as far. The second custom variant is Super Timber. While each stage is slower, the watering can has an extended range, and the tree is larger, more durable, and deals a greater amount of damage. Dream Home (called Housewarming Party in PAL regions) is Villager's Final Smash. When used, Villager calls Tom Nook and his nephews, Timmy and Tommy, and pays them to build a house around any nearby opponents. While the house is being built, the trapped opponents take repeated damage. Once the house is finished, it explodes, launching the trapped opponents and any others around it. If there are no opponents nearby upon activating the move, Tom, Timmy, and Tommy will look around confusedly and leave. Yume no Mai Hausu Dream "My House"
The male Villager in Mario Kart 8. The Villager appears in Mario Kart 8 as a downloadable character, available for purchase as part of the Animal Crossing × Mario Kart 8 DLC pack as one of the two playable Animal Crossing characters, with the other being Isabelle. Like with Super Smash Bros., both a male and female villager variant are available, both based upon the boy and girl villager artwork from Animal Crossing: New Leaf. Its kart symbol is the leaf symbol that represents furniture in the Animal Crossing series. The male Villager shares his stats with Tanooki Mario, while the female Villager shares her stats with Cat Peach. The Villager is the only character in Mario Kart 8 that does not have a voice; instead, he/she uses many sound effects from the Animal Crossing series. Both Villagers return as playable characters in Mario Kart 8 Deluxe for the Nintendo Switch. Unlike the Wii U game, they take up separate locations on the character select screen (and therefore are treated as separate characters), and are included within the base game. In Super Mario Maker, players can unlock an 8-bit Villager costume either at random by completing the 100 Mario Challenge on Expert or Super Expert mode, in which there is no costume unlocking criteria, or by scanning a compatible Villager amiibo using the GamePad. The costume is exclusive to the Super Mario Bros. style and can be placed within Mystery Mushrooms. It can be donned by Mario once he acquires one of these mushrooms, thusly borrowing the character's appearance, movements, and specific sound effects. If button is pressed and held while the character is idle, he pulls out a small red balloon. If the character loses a life whilst wearing the Villager costume, the usual death jingle is replaced with the theme that plays after fainting in Animal Crossing: New Leaf. The Villager costume is designed after his appearance in Super Smash Bros. for Nintendo 3DS / Wii U.
DS Animal Crossing: Wild World The male player character from Animal Crossing. He feels the need to set out on his own and move into town. Chatting with neighbors is a given, but there are a ton of other things to do as well, like collecting furniture, customizing rooms, catching fish and bugs, digging up fossils, etc. He may get bee stung or fall in a pit, but he still has fun. 3DS Animal Crossing: New Leaf (06/2013) An energetic young man from a peaceful town in Animal Crossing, he is eager to make his Smash Bros. debut! His Balloon Trip recovery lets him fly like a character from Balloon Fight. The Villager sets out to answer that age-old question: If a tree falls on the battlefield and foes are beneath it, do they get launched? This chipper chap came all the way from his quiet little village to do a bit of aerial sightseeing, take Lloid out for a spin, look after the trees and maybe do some bowling. If you're very lucky, he might even bring along Tom Nook and the Nooklings and throw everyone a party. Gosh, this all sounds like such fun! 3DS Animal Crossing: New Leaf (06/2013) Just a normal girl living a normal life in a normal town—her special moves, however, are anything but. She can pocket items, projectiles, and even beams, and then pull them out at a moment's notice. Her down special lets her plant a tree, water it, and chop it down. If she leaves the tree standing, she can use the axe against foes. This girl's special moves are very special indeed. The standard one lets you pocket items, projectiles and even laser beams, then use them by pressing the button again. Her down special plants a tree, which you can water and finally chop down to hurt other fighters. Or you can leave the tree alone and attack with the axe. Up to you. N/A If you're wanting to buy a house in Animal Crossing, Tom Nook is always happy to help. And it looks like he's expanding his business to Smash Bros, too. If you activate the Villager's Final Smash, Nook will rush in and build a house for you right then and there! One small, very minor difference between this house and ones in the original game? This one explodes. PAL region names are displayed below the North American names. Viridi: Oh look, it's the Villager! Pit: Villager, huh? That's not a very creative name. Viridi: Well, what else do you call someone from a village? Anyway, you've got to respect the Villager. Word has it no one fights fairer than that one. Viridi: Probably because where the Villager's from, there's a mole who goes around punishing cheaters. Palutena: Anyway, the Villager's Lloid Rocket can do some real damage, so try your best to reflect it back. Artwork of one of the female Villager variants. Artwork from the boxart of Super Smash Bros. for Nintendo 3DS. Villager using the net attack in a trailer. Villager battling Mario, Link, and Kirby as he prepares to capture a Smash Ball. Villager intercepting a missile fired by Samus. Villager using boxing gloves to counter Bowser. Four varieties of the Villager. This page was last edited on March 3, 2019, at 09:34.